So you’re traveling through the airport, and you’ve got your backpack loaded up with all your gadgets. You get through the security checkpoint, and now what? Well, how about if you could just plug your backpack in, and have it recharge all of your USB devices? What if that same backpack had a built in battery to recharge your devices whenever you need it too? Sounds cool, right? 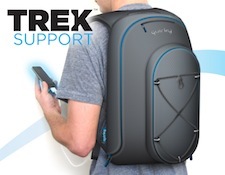 The Trek Support backpack is a “checkpoint friendly” bag with a built in USB hub, and an extension cord that plugs directly into the wall to power that hub. This means that when you have a few minutes of down time between flights, or when you get to your hotel room, you can just plug the backpack into the wall and recharge up to 3 USB powered items at once. It’s also got mesh pockets for those gadgets, holds up to a 15″ laptop, and even has a built in rechargeable battery so you don’t even need to be plugged in all the time. Now, this is another Quirky project so the pre-order price is $130, but the final price will be $150. Personally, I like the design and the idea. My only concern would be how much weight is added by all the extra electronics required for the battery and charging system.